BTG News | Bevel Tech Group, Inc.
It’s that usual time of the year when Bevel Tech Group, Inc will be traveling to San Antonio, Texas to attend and exhibit in the 2017 Subsea Tieback Trade Show. The event is scheduled for March 21st to March 23rd at the Henry B Gonzales Convention Center in downtown San Antonio, Texas. San Antonio, Texas is a great place to visit and take in some of America’s historic culture, along with great food and entertainment on the River Walk. Please stop by our booth #237 any time Tuesday thru Thursday and say HELLO. We would love to hear and see you at this year’s event. Also remember, there is a Harley Davidson motorcycle given away each year at the conclusion of the event. No purchase is necessary, just stop by the participating trade show booths and get your registration card stamped and deposit it in the drawing before the closing event on Thursday afternoon, and maybe YOU might be riding home on a new Harley Davidson motorcycle! As our economy slowly begins to show some steady progress, plant maintenance, new construction, and turnarounds continue to dominate our business in the last few months. As we continually acquire new customers, they all are very excited and quite pleased with our quality work and performance. With that said, we never rest, but continually build on our technician expertise, training, and qualifications, and expand our access of some of the newest and latest technological devices which not only continue to improve our safety and quality, but can provide reports and documents that quantify our work according to your specifications. All this, at no extra cost to our customers. To see all of the services we now offer, visit our web site at www.beveltechgroup.com. 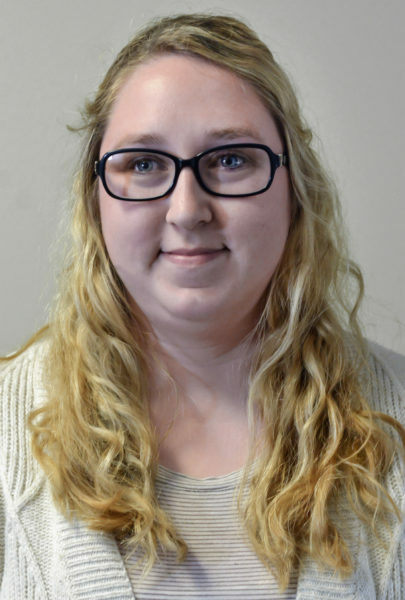 Bevel Tech Group, Inc would like to announce the promotion of our part time administrative secretary Abby Delatte, to Manager of Human Resources. Lets all join in and welcome our LSU graduate Abby Delatte and wish her the best of luck on her new full time career at Bevel Tech Group, Inc.
Abby can be contacted by emailing her at abby@beveltechgroup.com. Or just walk thru our front door and you will be greeted by her smiling face! As Manager of Human Resources, I handle employee relations and employee benefits. On a day to day basis, I am responsible for various office tasks and some community outreach duties. I also assist in making sure all our employees are current and up to date on all required paperwork and documents, drug screens, and annual physicals. If you stop by the office, I will most likely be the first person you see as you enter our office area. I began working part time at Bevel Tech Group, Inc in October 2014 while attending college at LSU. I previously served as an Intern at CF Industries in Human Resources – Employee Relations. I recently graduated from Louisiana State University with a Bachelor of Science in Human Resources Education with a concentration in Leadership. Upon Graduation, I accepted a full time position with Bevel Tech Group, Inc. I chose to go into the Human Resources field due to my love for people, problem solving, ethics, and the ever changing laws. Each situation I take on is different, which makes my job more interesting and enjoyable. My hobbies include attending LSU Football and Baseball games, visiting family, and traveling. I would like to start this month’s Bevel Tech Group, Inc newsletter by sending prayers and best wishes out to all those impacted by the recent tornados and to the thousands of families, friends, and neighbors who are still struggling to recover from last years historic flood. Even though the flood was in August 2016 (7 months ago) the rebuilding process is still affecting so many people. Every day I see more houses being demolished, FEMA trailers showing up. Some are lucky and are now back in their repaired homes, many are in the rebuilding process, some have been devastated and walked away, and many are still only getting started in the recovery process. We ask that if you have any spare time, equipment, materials, or any kind of resources, reach out and help those in need. It has been and still is for many a very difficult and challenging time. Bevel Tech Group, Inc has been adding additional industrial services for the past few years to make it simpler for our Customers to receive most, or all of the services they need from one Company. This can help our Customers obtain lower overall cost. When we are selected to perform large segments of work at a site, we can work with your company to stage equipment trailers onsite to reduce or eliminate delivery times of equipment. Since we own all of our tools and equipment we can control project cost to our Customers. For specialized applications or machining projects, our in house engineering department can custom design tool or equipment modifications to meet all Safety and Quality needs. This can significantly reduce schedule time and costs to our Customer. Exxon Refinery – GLA1X including the use of our FARO Vantage laser coordinates measuring device to set critical setup alignment of compressor gearbox train. Bevel Tech Group, Inc would like to introduce our newest member of our elite Staff of Professionals. 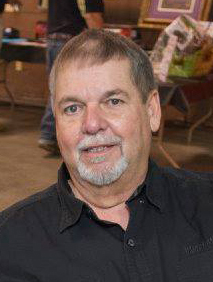 Marty Martin joins us with almost 40 years of service in the Oil, Gas, and Industrial fields of service. Marty can be contacted by emailing him at marty@beveltechgroup.com. Maintain strong relationships with existing client contacts within the Deep Water piping and products industry and develop new opportunities with the major oil producers, engineering firms, lay contractors, coating contractors and pipe manufacturers. Seek out and develop opportunities for services related to the Deep Water piping industry with regards to CNC machining of pipe products, OD coating machining applications and our newest service PEMS Laser Measurement system. June of 2017 will be (40) years in the oil and gas industry and as all of us can attest it’s been an interesting ride over the years. I started out chasing drilling rigs in the Rocky Mountains of Wyoming in field sales and over the years I have held a vast assortment of sales, business development, sales management and project management positions to include general manager / business development of a 3rd party inspection firm. I have always worked for companies which provided a technical service typically associated with nondestructive testing, examples being: EMI and internal plastic coating of Oil Country Tubular Goods (OCTG), Vacutec Testing of underground storage tanks and the application of impressed current cathodic protection systems, AUT (Automated Ultrasonic Testing) on mechanized welded line pipe (SCR and flowlines) for both deep water (6K to 10K feet) and large OD land based projects. For the past (10) years I have worked with QA/QC companies providing 3rd party inspection services for the manufacture, coating, welding, AUT auditing, traceability and end measurement services for both the onshore and offshore pipeline industry. Automobiles (classic, performance, hotrod, doesn’t matter) Outdoor sports to include bay fishing, bird hunting, golf (I own a set of clubs and a pair of shoes), sporting clays etc. Pretty much anything to do with hunting, fishing, shooting guns, and cars, I’m ready. Bevel Tech Group, Inc continues to bring you high quality and dependable industrial services to assist you in your every day needs. We are on call 24 hours per day, seven days per week. You can reach us via phone at 1-225-677-8276. Our answering service will accept all incoming calls after our normal shop closing time and we will quickly return your call. Feel free to visit our web page at www.beveltechgroup.com. Our web page gives a description of all the services we provide. It also contains links to important information and list email contact information for most of our staff. Listed below are just a few highlights of our business services, we’ll include more in future monthly newsletters throughout 2017. If your business is in the Deep Water sector of business, you know Bevel Tech Group, Inc has been the leader in counterboring of deep water SCR (Steel Catenary Piping) piping for over a decade. We were the first to develop and implement the automated machining process to meet the ever increasing tolerances and specifications, and our automated process produced finished products at a much faster pace, eliminating substantial costs for our clients. Our customers came to us for help in developing processes to cut, remove, and/or modify coatings on their deep water piping. Our engineering department developed tools and processes to meet our customers needs. Today we continue to provide various methods to modify deep water pipe coatings. Trouble finding Millwrights? You’re not the only one. At Bevel Tech Group, Inc, we not only supply you with NCCER certified Millwrights, we are an official NCCER Accredited Training and Assessment Center. NCCER is a not for profit 501 (c) (3) education foundation created by the construction industry to develop standardized curriculum with portable credentials and to help address the skilled construction workforce shortage. Field Maintenance has always been our specialty. We build and/or own most of our equipment and stock it in our own shop. Whether you need a two inch pipe cut or beveled, or a 18 ft diameter flange re-faced, we’ve got the tools on hand and we’ve done it successfully time and time again. We also offer a tool rental service for those companies that have qualified talent to operate those types of machines. We offer many turnaround services including line isolation and weld hydrotest services. Line isolation and test services are critical in nature, and we pay close attention to detail while performing those services. This type of service is in high demand because it eliminates a lot of scaffolding and does not require complete decontamination of plant equipment. The process yields substantial savings for the customer. At Bevel Tech Group, Inc, Safety and Quality are always our most important deliverables to our Customers on each and every job we perform. Give us a call or visit our website to see what we can offer. 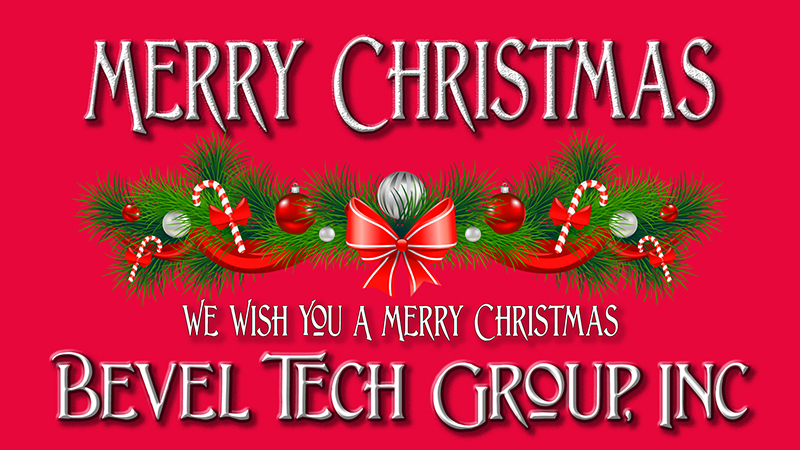 As 2016 draws to a close, we at Bevel Tech Group, Inc would like to THANK all of our customers for their trust and support throughout this past year. With the collapse of the oil industry over the past 12 to 18 months, both businesses and consumers have had to “tighten their belts” as we all struggled and endured over that time. Hopefully 2017 will bring us growth and prosperity. And lets not forget so many of our local families, friends, and neighbors who lost so much in the historic flooding that took place in early August of this year. Many people lost everything, something many of us hope we never have to experience. We are thankful for the spirIt of our Louisiana citizens who responded immediately in the time of need. And of course, the road home is still very far away for so many. Even though the flood happened almost six months ago, many have not yet begun the rebuilding process. Lets remember our families and friends as we prepare to celebrate Christmas. Wishing you and your families a Merry Christmas and hopefully a Happy and Prosperous New Year. PLEASE REMEMBER THAT ALTHOUGH OUR OFFICES ARE CLOSED OVER THE HOLIDAYS, OUR PHONE ANSWERING SERVICE IS AVAILABLE 24 HOURS PER DAY, 7 DAYS PER WEEK. YOUR CALLS WILL BE RETURNED PROMPTLY AND WE WILL ATTEMPT TO STAFF ANY NEEDS THAT YOU MAY HAVE. As many of you know, Bevel Tech Group, Inc steps up when the community, schools, or other organizations are in need. Since the historic flood in our area in August of this year (2016), many people and organizations continue to struggle to rebuild and move forward. We at Bevel Tech Group, Inc take pride in the fact that we step up to help many of our local people. 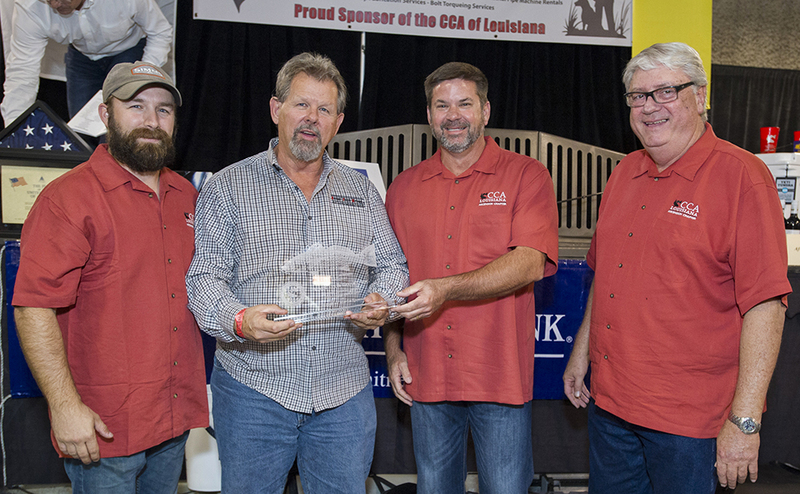 The Ascension Parish CCA Chapter banquet event scheduled earlier this year had to be postponed due to the flood, but our great CCA committee was able to reschedule the event and it was held last week, Thursday, November 10th, 2016 at the Lamar Dixon Expo Center. As with previous years, Bevel Tech Group, Inc was a major corporate sponsor and this year we were proud to be the Blue Marlin Title Sponsor for the event. As usual, the event was wonderfully planned and organized by our outstanding Ascension Parish CCA committee. The postponement of the event did not distract from its usual success. The event was a great success with overflowing attendance. Pictured below is Kevin Bourgeois, Owner and Operations Manager of Bevel Tech Group, Inc, being presented with an appreciation award for our continued support to the Ascension Parish CCA events. The stated purpose of CCA is to advise and educate the public on conservation of marine resources. The objective of CCA is to conserve, promote and enhance the present and future availability of these coastal resources for the benefit and enjoyment of the general public. The Coastal Conservation Association of Louisiana is dedicated to the conservation and preservation of our state’s marine and animal life. It is a non-profit group organized under Section 501(c)(3) of the Internal Revenue Code. CCA Louisiana is a state chapter of the Coastal Conservation Association (CCA) and prior to 1997 was known as GCCA of Louisiana, the Gulf Coast Conservation Association of Louisiana. This year’s event was full of activities, including a silent auction of many unique items donated by various individuals and organizations. Many of those items were one of a kind in nature. Many other prizes were raffled off, auctioned off, or given away as door prizes. The highlight of every annual event is the auction of many items including items such as an African Safari, exotic fishing or hunting trips, dinners and cookouts, apparel and purses for the ladies, and so much more. And last, but not least, a boat, motor, and trailer giveaway raffle. All items are donated to the CCA which makes the event a major income event for the organization. Pictured below are some of the photos with our employees and guests who attended this year’s event. Congressman Garret Graves speaking at the Ascension Parish CCA event. John Torregrossa and Mike Murray, Bevel Tech Group, Inc Supervisors receiving their lifetime member certificate at this years event. As Program Manager, I have been responsible for selecting our business software. I have been involved in setting up our file servers, creating directories and sub directories for all business files. I am responsible for a document control system that I set up and update regularly. I have been responsible for creating many procedures, forms, and other electronic documents. As Marketing Manager, I am responsible for much of the advertising work done for Bevel Tech Group, Inc. I have been responsible for setting up and creating advertising for many business functions, including one to two trade shows per year for the past 7 years. I am accountable for publishing a monthly newsletter and also generate other types of business advertisements, communications, social media, and much more. I started working for Bevel Tech Group, Inc in July of 2009 after working/retiring for Shell Chemical Company for 32 years. My work with Shell was both domestic and overseas, and included various job titles and functions. Photography and motorcycles are my hobbies, besides trying to keep up with my grand kids! Fall season is upon us and its also a time when many plants and industries utilize the cooler weather to perform plant turnarounds and major equipment maintenance. Some plants choose to perform a partial plant outage while others prefer to take the entire plant down for scheduled maintenance. This month Bevel Tech Group, Inc would like to highlight the many services we provide to the plants and industry. We already are performing some of these services for turnarounds and plant outages in the area and have more scheduled in the next few months. NCCER (National Center for Construction Education and Research) develops standardized construction and maintenance curricula and assessments. 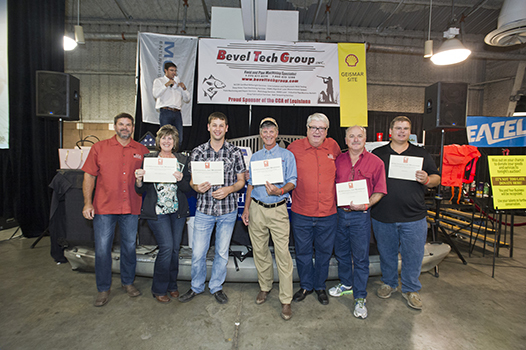 Bevel Tech Group, Inc is a NCCER Accredited Training Sponsor and an Accredited Assessment Center. All our Millwrights have ascertained the NCCER certification. Our certified millwright services include maintenance and repair, new installation, and preservation of various types of equipment. Bevel Tech Group, Inc. has experience in all aspects of installation and repairing equipment including pumps of any type, mixers, gearboxes, conveyers, bucket elevators, centrifugal and reciprocating compressors, steam and gas turbines, blowers and fans, and much more. Besides the many millwright services listed above, Bevel Tech Group, Inc also provides a wide array of other services, specializing in performing many of these services at our Customer’s site or alternate locations. We routinely perform pipe cutting with our pneumatic split frame clamshell pipe cutting machines. We also perform pipe beveling and flange facings of various sizes. We own and stock most of our equipment so that there is no long wait for a machine to be delivered to us. We also have tool and equipment rental services, providing state of the art equipment rentals to Customers who choose to provide the manpower to perform some of these tasks. Visit our web site pages to see all the field machining services that we can provide. Our line isolation and test tool services can positively isolate and monitor potentially explosive vapors while performing the hot work on the upstream line. It can then be slightly moved to effectively hydrotest the new weld connection utilizing the same tool while using a minimum amount of water or test median. This provides the customer with an approved means of isolation and weld test while minimizing the hydrotest median volume. Our standard isolation/test tools range from 3/4 inches to 36 inches and are available at your request. We have the tools for multi-schedule piping and can reach test pressures up to 2250 psi. If a size larger than 36 inches is needed, contact us with your pipe size and schedule and specific info and we can see if we can supply you with one. And last but not least, don’t forget about the MONEY saved by eliminating the de-inventoring and decontamination of lines and vessels, and the elimination of scaffolding needed for various blinding points when using our line isolation and weld test services. We utilize a wide range of compact, light, safe, and easy to use hydraulic torque tools for loosening and/or tightening the bolts. We offer services to tighten bolts while equipment is in service (hot bolt), or services to loosen and tighten bolts during plant maintenance, turnarounds, partial unit shutdowns, or equipment outages. Hydraulic bolt torquing can save you time vs other conventional bolting techniques and many companies have critical paths to conform to during their shutdowns, so hydraulic bolt torquing can help our Customers meet their critical path schedules. Recognized as an industry standard for leak prevention, hydraulic bolt torquing can help to prevent leaks on flanges, exchangers, vessels, or on any application where tightness of bolts is critical to prevent leaks. Lead Field Supervisor for Millwrights and FARO Laser Dimensioning. 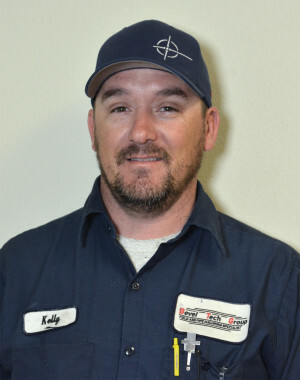 Job Description: I started in the industry at the age of 19 as a Millwright helper. Over the years I have adapted to whatever work was needed for me to perform from pipefitting, welder, iron worker, civil work and heavy equipment operator. I am proud to say that I have over 20 years in the industry and I am still young enough to learn new things, but more importantly I pride myself in teaching the next generation of workers in the skill set and thinking process that is needed to do our job effectively and safely. I strive everyday to be the leader that I have learned from and hope that I can pass along a positive and responsible attitude. Bio: I have been married to Chara Thigpen for 13 years. We have a son, Layton who is attending his sophomore year at St. Amant High School. On my off time we enjoy the baseball life, motocross, being around family and friends, and living life to the fullest. © 2015 Bevel Tech Group, Inc. All Rights Reserved.